Choisya is a small genus of aromatic evergreen shrubs in the rue family, Rutaceae. Members of the genus are commonly known as Mexican orange or mock orange due to the similarity of their flowers with those of the closely related orange, both in shape and scent. They are native to southern North America, from Arizona, New Mexico, Texas and south through most of Mexico. In its generic name Humboldt and Bonpland honoured Swiss botanist Jacques Denis Choisy (1799-1859). Choisya species are popular ornamental plants in areas with mild winters, grown primarily for their abundant and fragrant flowers. The foliage is also aromatic, smelling of rue when bruised or cut. The most commonly found cultivars in the horticultural trade are the species, C. ternata (shown here), the golden-leaved C. ternata 'Sundance', and the inter-specific hybrid C. 'Aztec Pearl' (C. arizonica x C. ternata). All three varieties have gained the Royal Horticultural Society's Award of Garden Merit. The flowers are also valued for honeybee forage, producing abundant nectar. Join me for Floral Friday Fotos and please leave a comment once you contribute. It is such a brilliant shrub: flowers three times a year on oyr sandy soil, and smells quite nice. How pretty! And, Happy Spring! Here in Ohio it is so very welcome after a very cold winter. Exquisite photo. Love the soft, natural light. I love Choisya - there is another plant also known as Mock Orange - Philadelphus. I used to grow a single and double flower, both smelled gorgeous in the spring, but sadly became infested with black aphids every year, so eventually I had to have them removed. Nice photo. Choisya is a rewarding shrub in the garden. 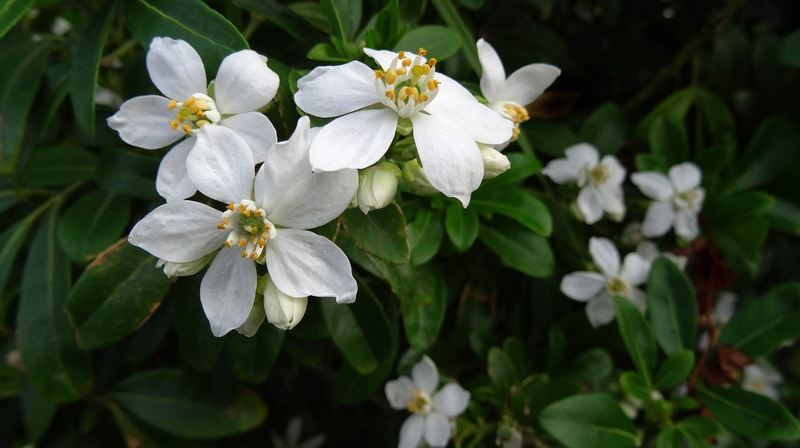 Wonderfully fragrant flowers and the evergreen foliage looks great through winter months! Thank you for hosting - great to find a fun meme in our Hemisphere! Amei estas flores brancas delicadas!! !